Beautiful Incentives: Chrome Add on-The Honey extension/app for coupons in an instant. Chrome Add on-The Honey extension/app for coupons in an instant. Ever want coupons at the drop of a hat without having to rely on your memory to search retail me not and other coupon sites? How many times have you forgotten to do this? Don't lie! Fret not, you won't have to any longer, with your "honey" by your side. "Honey, where was that coupon I wanted?" Oh yeah, RIGHT in front of me! Woot woot! Sweet Sweet savings, you have finally come to me! "Automatically find and try coupon codes with 1-click. Works at over 100 top stores in the US, Canada and UK.Save time and money when you shop online. 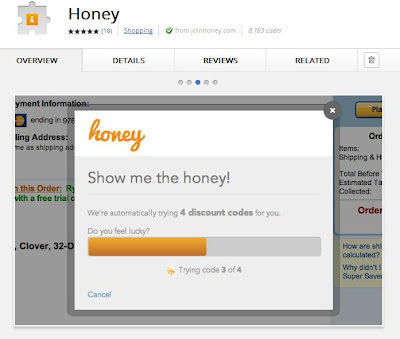 Honey automatically finds the best coupons and promo codes and tries them for you with just 1-click. Get discounts just for clicking a button. Currently works at sites like: Amazon - amazon.com Amazon Canada - amazon.ca Amazon UK - amazon.co.uk Ace Hardware - acehardware.com American Eagle - ae.com Aeropostale - aeropostale.com Athleta - athleta.com Banana Republic - bananarepublic.com Barnes and Noble - barnesandnoble.com Bath and Body Works - bathandbodyworks.com Beauty.com - beauty.com"